The Open Beta program for OnePlus 3/3T has ended and the official stable Oxygen OS 5.0 is now rolling out. This makes OnePlus among the select few manufacturers to roll out the official Android 8.0 Oreo firmware upgrade. Only a few manufacturers have successfully compiled the and deployed 8.0/8.1 Oreo Beta ROM. So if you have a OnePlus 3 or 3T phone, you are lucky to receive stable Oreo ROM based on Oxygen OS 5.0. Following we have listed OTA updates and signed firmware zips and procedure to install. The Oxygen OS 5.0 for OnePlus 3 and 3T features all the Android Oreo goodies like Picture in Picture mode, Autofill for passwords, Smart text selection, new Emojis, notification categories, and much more. Apart from the Oreo features, you will see many OnePlus specific features as well. This includes Parallel apps, using which you can have multiple instances of the same application to log into different accounts. 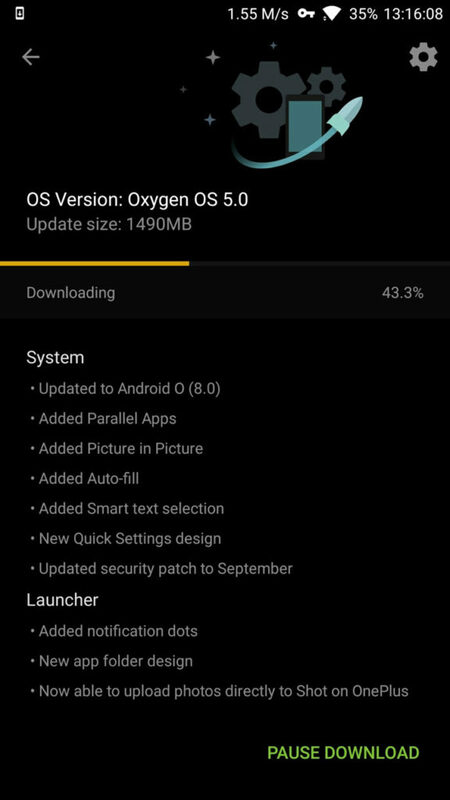 Oxygen OS 5.0 also brings the September 2017 security patch. Though this is not the latest patch, it is still something. The latest Open Beta 27/18 for OnePlus 3/3T features the newest October 2017 security update. So if you want the latest features, you better be on the latest Open Beta update. How to download Oxygen OS 5.0 OTA update? As this is the official updates, not all the devices will receive it at the same time. So you will have to capture OTA update using the following methods. There are two ways to update the OnePlus 3/3T to the latest Oxygen OS 5.0. The first is to go to Settings app > System updates > Check for OTA updates. This is the easiest method. However, if you don’t see the update here, then go through the following procedure to download OTA. Make sure your OnePlus 3/3T is on the previous Oxygen OS 4.5.1. If your device is on Open Beta update, then see the second Local upgrade method below. Enjoy the latest Oxygen OS 5.0 onto your device. 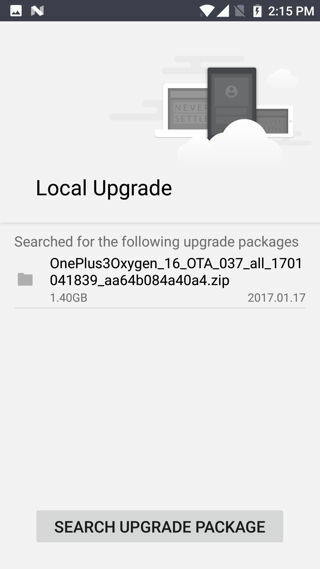 How to install Oxygen OS 5.0 onto OnePlus 3/3T using full stock firmware file via Local upgrade method? First, download the OxygenOS 5.0 full firmware package from below for OnePlus 3/3T. 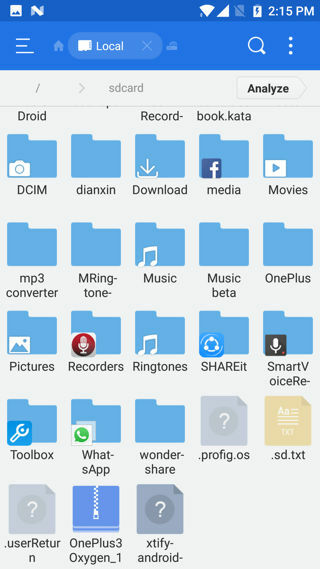 Transfer the file to the root of phone storage. Meaning, outside every folder. See the image below. Now visit Settings> System update> Tap on the top right settings icon > Choose local Upgrade. Here is a video tutorial for reference. The following video is using an older firmware package. However, the same procedure can be used to install Oxygen OS 5.0. So you can download the OTA update from above and flash it using stock recovery or ADB sideload method. Read: How to install OTA updates on any Android phone? Our older post on how to install OTA updates using ADB sideload method. Another post for ADB sideload method here. Use this to update using Local Upgrade method or flash using latest TWRP. What is the future of OnePlus? Even though this is the last Android upgrade for OnePlus 3 and 3T devices, the phones are still going to receive monthly security updates. This means all the latest Android security patches will roll out for OnePlus 3/3T for the nest one year. Now, the manufacturer will focus on the OnePlus 5 and OnePlus 5T’s Android 8.0 Oreo firmware upgrade. This will come with Open Beta which will start by the end of November 2017. So you may receive Oreo for OnePlus 5 as soon as next week. Once the Open Beta ends, the two devices will receive official Oxygen OS 5.0. So stay tuned and keep visiting us for more such updates. You have a link for oneplus 3 full zip please?